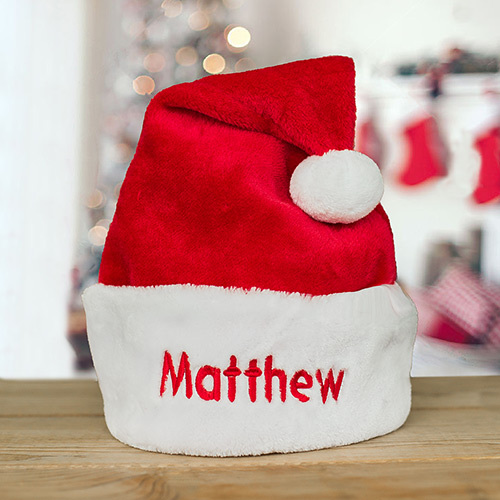 Your loved ones will know they made Santa's nice list with our Personalized Santa Hats. These fun and festive hats will make your Christmas gatherings and photos even more special. The soft and comfortable Santa hat is adorned with a plush pom-pom and trimmed with white fur, and it can be embroidered with any name. The 18" tall hat offers approximately 24½″ around the inside of the hat and fits most adults. Exactly what I ordered!! Perfect! Additional Details A personalized Santa hat just begs for a personalized stocking to go with it! Shop today.